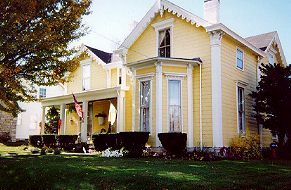 Our Bed & Breakfast, built in 1876, is on Register of Historic Places. A house of many gables with decorative vergeboards, applied pilasters, bay window. Bracketed eaves & finished with a unique siding which simulates cut stone. Windows & doors & interiors are all original. We have four rooms with private baths. Three on the second floor, one on the first floor. Also on the first floor is a living room, dining room, family room & kitchen. Our French country dining room is where we serve our full, hot breakfast to our guests. Our rates range from $75-95. We accept VISA & MasterCard. Our policy is to cancel at least 48 hrs before arrival. If not a deposit of one half room value will be charged. No shows will be charged full price. We are not handicapped accessible & smoking is permitted in certain areas. Children are welcome. This and other Georgetown Bed and Breakfast Inns can be found here in The Register. Romantic Country Inns, Getaways and B&Bs offer a great Kentucky lodging alternative to big hotels.